VAVA mobile pet cam can help end pet boredom and separation anxiety. Given the chance, every pet owner would take their beloved friends everywhere they go. But the thought of having your dog or cat around at the board meeting doesn’t sound very pleasant. Pet cams were invented to solve the problem of not knowing what your pet is up to when you are away. While the regular pet cams are a great invention, they are not designed to be mobile. You have to install them in every room in the house and even outside. Asides the obvious financial implication, monitoring multiple cams is a full-time job. At the end of the day, the purpose of the pet cam won’t be achieved if you have to abandon all you’re doing to see what your pet is up to. The VAVA mobile pet cam gives you a real-time feed of whatever your pet is up to anywhere in the home. The cam has wheels with treads that are designed to move smoothly on all surfaces. Combine this with the 1080p camera and intelligent sensors, and you get the perfect tool to monitor your dog’s activities, every time and everywhere. Even if your pet creeps under the bed, the Vava mobile pet cam is compact enough to follow it. The device’s rechargeable 5000mAH battery allows it to last for up to 7 days on standby. Beyond monitoring your pet while you’re away, the Vava mobile pet cam can also help you keep your pet entertained. There’s only so much time your pets can spend with the regular toys before they get bored. Vava comes equipped with numerous games you can activate from the mobile app in order to keep your pet entertained. How about a game of laser chase where your pet has to run around chasing lasers. You could even control the direction the laser points while playing the game. If your pet gets bored of chasing lasers, you could switch to butterfly tease or feather tease. If you wish to speak to your dog, there is an audio/mic option available. 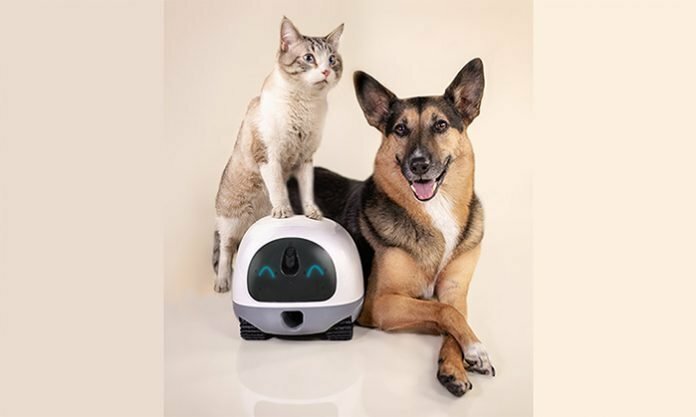 The Vava pet cam also allows you to treat your pet from anywhere you are. Simply press a button and the device dispenses great treats for your pet. Talk about staying with your pet even while you’re not there! Vava understands your pets would be intrigued by the small device that keeps following them everywhere. Thus, a bit of rough treatment is to be expected. The mobile cam boasts a sturdy build, with industrial grade materials that were selected for their toughness. The low center of gravity further adds to the stability, ensuring the pet cam stays upright even when your pet is playing with it. You can control all the features of the Vava mobile pet cam from a single mobile application that’s available on iOS and Android platforms. You can also take photos or record videos of your dog via the mobile app. The recorded videos and photos are stored on the free 1GB cloud storage that comes with the device. The Vava mobile pet cam is currently at the crowdfunding stage. The original target has been fully funded and the goal has been stretched. You can also visit the Indiegogo page to make your pledge and claim the pet cam as a reward.